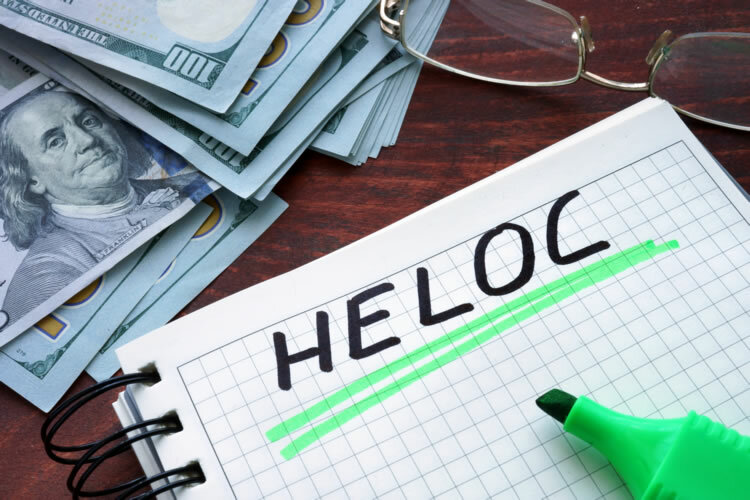 What is a HELOC? | What is a home equity line of credit? A HELOC (home equity line of credit) is a revolving line of credit issued by a lender using the borrowers home as collateral. Similar in some ways to a credit card, the HELOC allows the borrower to use and pay back money as needed up to the credit limit. The size of the line of credit issued for a HELOC depends on a number of factors including the borrower’s credit score and the amount of home equity available. Bank of America has a good article on evaluating the equity in your home and how that is used to determine HELOC amounts. There is also a HELOC calculator available from Bankrate. Unlike a credit card, a HELOC has a limited amount of time the line of credit can be used. Typically the time limit ranges from 5 – 10 years. Once the line of credit expires it can no longer be used and the balance outstanding must be paid back to the lender within a specific timeframe, anywhere from 5 to 20 years. HELOC’s typically only require that the interest get paid each month. The principal amount used does not have to be paid back until the line of credit expires. Unlike home equity loans that have a fixed interest rate and payments, HELOCs have a variable interest rate and variable monthly payments depending on the outstanding principal balance. The interest paid on HELOCs may be tax deductible. Please check with your tax advisor to understand the tax benefits. The HELOC provides more flexibility than a home equity loan since you can withdraw money as you need it versus taking it all up front. Unlike home equity loans, HELOCs don’t require a formal closing and usually have lower upfront fees. Because HELOCs are secured by the borrowers home, it can result in foreclosure if payments go into default. Are there any up-front costs or any annual fees? How long is the term for the line of credit? How large of a line of credit do I qualify for? What is the interest rate and is there any annual cap? What happens if interest rates go down, how low can my interest rate go? Is there an option to roll over the full amount due to a fixed loan once the HELOC expires? Does a HELOC allow you to better manage existing debt? This is possible if you are using the HELOC to pay off your high rate credit cards. Does a HELOC help you cover short term needs that can be paid off within a year or so? Remember, the interest rates are variable so a longer term debt could end up costing you quite a bit more if interest rates rise. Are you using the HELOC for something you need versus something you want? Improving your lifestyle or financing a family vacation are not good reasons to get a HELOC. Would the HELOC tempt you to use the money carelessly? If you have trouble keeping your credit card costs under control this may not be a good fit. Unlike a credit card default a HELOC default could result in a home foreclosure. Understanding HELOCs (home equity lines of credit) can take some time. Determining whether a HELOC is right for you depends on your current financial situation and your longer term financial goals. Take your time to evaluate all of your financial options and consult a debt expert or financial advisor if you feel you need help making an informed decision. If you find yourself struggling to make payments on your home equity loan or HELOC, or you are already in foreclosure for your first mortgage, speak with a PCS Debt Relief advisor as soon as possible to find out what your options are. At PCS, our programs are tailored to the client’s specific financial needs. What sets us apart from our competitors is that clients see relief, before any payment is received. Our NO UP-FRONT FEE policy ensures our client’s a 100% satisfaction guarantee. We also do not charge any monthly fees or any cancellation fees. We want the client to feel comfortable during the whole process that’s why we allow them to be part of it every step of the way.